My 17” Dell Vostro notebook at work is a nice and powerful machine for the tasks I run on it. It has one problem though. It gets hot where I place my left palm beside the trackpad. I had been using a cheap notebook cooler from meritline but it broke within a few months and the fans started rattling. So, it was time to invest in a better laptop cooler. After a bit of research, I found one that was pretty decent in price and had great reviews from people who used it. 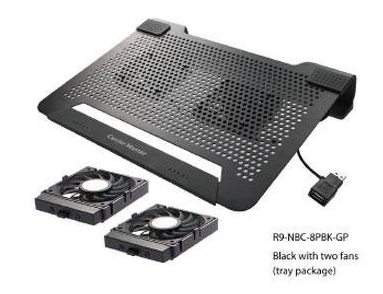 This laptop cooler is unique from the rest in many ways. First off, it is made of a single composite element with a curve to angle the laptop. Just this design would give nice airflow to alleviate heat problems. It has nice rubber edges to give the stand a good grip on smooth surfaces. You get 2 fans with the U2 model and there is a U3 model with 3 fans if you want more fan power. Again a another unique feature with this stand is that the fans are detachable. When I say you can remove it, it doesn’t take a mechanical engineering to do it. You just press on a plastic part and pull. To attach it back, you just press again and place it anywhere in the cooler. The fans are USB powered and the USB adapted actually has a USB portt for you to use. So, if you are short on USB ports on your laptop, you won’t lose anymore by adding the cooler. This can be incredibly useful as different notebooks have heat problems in different areas. This design lets you place the fan you most need it. The stand is designed in such a way that you can insert your laptop to the bottom side and store it in your laptop bag. (fans removed of course). I am extremely satisfied with this cooler after using it for a few weeks now. I can rest my palm without it starting to get misty with sweat. Now, a few cons with the laptop so you make an informed decision buying it. The laptop angle on the stand is a bit too high compared to others. It took me a few days to get adjusted to seeing the laptop like a desktop monitor. 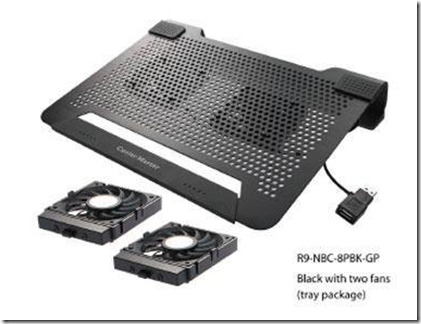 Cooler Master NotePal U2 Notebook Cooler is available on Amazon for ~$19 for the 2-fan model and around $35 for the 3-fan model. It’s obvious that it’s a little expensive just for a cooler but if you’ll consider the functionality and the fan power, the price is worth it.